IMEX Transport provides fully C-TPAT compliant border crossing services to meet the multitude our client's needs for international freight. We have the expertise and expereince necessary to handle the intricatices of dealing with demanding customer service, customs-clearance and documentation, while providing door-to-door solutions anywhere within North America. With our comprehensive logistics, we can manage your entire supply chain within Mexico and the U.S. 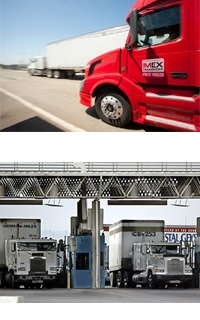 Dedicated Fleet of 60+ Trucks: IMEX Transport has the capacity backing to meet all of your border-crossing demands. GPS tracking on all Trucks: We take full precautions in regards to driver saftey and to make sure that our customers' product and logistics needs arrives on time. Full visibility to your freight from door to door: With our fully customizable IT solutions, your freight information is never more than a click away.